When criminals go unpunished they are emboldened by the impunity they enjoy, and go on to commit more of the same crimes. This is the case in Cameroon where state security forces have, for decades, enjoyed impunity for heinous crimes committed against unarmed civilians. Now, feeling emboldened and beyond the reach of the law, their criminality knows no bounds, and civilians in the Far North and Anglophone regions in the northwest and southwest are paying the price. In July 2017 Amnesty International published a report that spotlights secret torture chambers in Cameroon. The report documents the cases of 101 individuals who were held incommunicado, tortured, and sometimes killed by state security forces between March 2013 and March 2017 in facilities run by the Cameroon military and intelligence services. In the 73-page report, titled "Cameroon's Secret tortured Chambers: Human rights violations and War crimes in the fight against Boko Haram", Amnesty International states that the use of torture by security forces has become widespread and routine, and is practiced with impunity. Violations documented in the report include arbitrary arrest and detention, incommunicado and secret detention, death in custody, and torture. According to Amnesty International, the actions of Cameroon security forces constitute war crimes and violations of international human rights law. The detailed report, which includes concrete recommendations, a letter to President Paul Biya of Cameroon, and a letter to U.S diplomat Michael S. Hoza - who served as U.S. Ambassador to Cameroon from 2014 to 2017 - accuses Cameroon's security forces, including the Rapid Intervention Battalion (BIR) of torture and war crimes. The report also includes a reply from Ambassador Hoza to Amnesty International in which he acknowledges receipt of Amnesty International's letter concerning allegations of human rights abuses, and affirms that the U.S. Embassy in Yaounde and the Department of State "take such allegations seriously...". Now, with a crisis in the Anglophone regions of Cameroon, state security forces have moved south -- deployed by the government to quell a popular uprising in the Northwest and Southwest regions. Their modus operandi remains the same: arbitrary arrests, incommunicado detentions, extrajudicial killings, and torture and cruel and inhuman treatment of civilians. Since the closing months of 2016 Anglophones in the Northwest and Southwest regions of Cameroon have been protesting against what has been described as "Francophonization" of the region. But what started as a call for reform in the educational and judicial system in the region has morphed into calls for secession and outright independence. Anglophones, who make up 20% of the country's population, feel marginalized and discriminated against by the Francophone majority for decades. Many now want an independent state of their own. In response to the calls for independence the government sent in security forces, and numerous, widespread human rights violations have been reported ever since. According to Amnesty International, unlawful killing of several people in the the Anglophone regions coupled with blocks on Facebook and WhatsApp have been reported, and represent an escalation of the government's campaign to silence any form of dissent. It is clear to me that gross human rights violations and war crimes have been committed by Cameroon's security forces in the fight against Boko Haram in the Far North. The violations are well-documented and should be investigated and prosecuted. The only question that remains is whether or not same crimes have been committed in the governments effort to quell the Anglophone uprising in the Northwest and Southwest regions. In order for war crimes to be committed there must, first of all, be an armed conflict. Reports on the ground suggest that there is an armed conflict, albeit in its early stages. According to Sky News three security forces were reported killed by "separatists" in the city of Bamenda in November 2017, and a source said the security forces were ambushed by armed men on motorbikes. At the time of this writing it was reported by Reuters that three soldiers were killed and four wounded by "separatist fighters" during an overnight attack in Kembong, a village in the Southwest region. According to Reuters, 25 soldiers and policemen have been killed in a series of raids over the past year. More than 15,000 Cameroonians have fled their homes for refuge in Nigeria, according to Reuters. On January 11, 2018 UNHCR reported that 8,050 Cameroonian refugees had been registered in Nigeria, mainly in Cross River State. According to BBC News Pidgin, the governor of the Northwest region, Adolphe Lele Lafrique, banned firearms and ammunition, and ordered the local population surrender any local or imported gun to the authorities. He also ordered a curfew, restricting the movement of persons and property between 8 pm and 6 am for a period of one week from February 10, 2018. BBC News Pidgin reports that the Northwest looks like a military zone. The way I see it, based on the above, the Anglophone crisis has escalated into an armed conflict. The armed conflict is in its early stages but it is nonetheless an armed conflict - with killings on both sides. Civilians and security forces are being killed. Social media reports of frequent gun shots in towns, villages and cities in the Anglophone region, support this assertion. Faced with attacks against security forces, the forces ramped up attacks against civilian suspects and perceived secessionists. Circulating on social media are gruesome videos and photographs of the crimes security forces reportedly leave in the wake, including a video of an interrogation of two suspects. 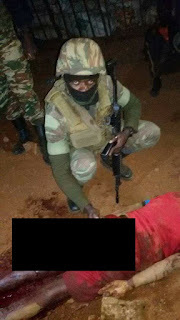 The video, reportedly captured in Belo in the Northwest region, shows security forces interrogating suspects after a reported attack on gendarmes in the area. A state security personnel can be clearly heard in the video threatening to shoot one of the unarmed suspects. What appears to be at least one of the interrogated suspects later shows up dead in other photographs. The most gruesome photograph of them all shows a member of the military cutting off the head of a civilian. Another photograph shows an armed member of the military stepping on dead civilians. I have been unable to independently verify the videos and photographs but they are worth investigating. If Cameroon is truly a state of law as claimed by government officials including the Head of State and the Minister of Communications such allegations of serious crimes would be investigated. The Anglophone crisis spiraled out of control due to the government's unwillingness or inability to dialogue. Rather than address grievances raised by Anglophones in peaceful protests in 2016 the government cracked down heavy-handedly on protesters - killing and imprisoning many. The government's brutal response radicalized many, forcing some to take up arms. Human rights violations and war crimes are, in my view, being committed on two fronts by Cameroon's security forces. The armed conflict with Boko Haram in the Far North is full-blown while the conflict in the Anglophone regions is in its early stages. The military operates on two fronts but the M.O. in both conflicts is the same.